This is a standard question on any Viking cruise. We’re a teaching club and historically everyone was welcome to take a turn on the helm. For some, these invitations by Viking Skippers have been a newcomer’s first introduction to keelboat sailing. These invitations are now limited to qualified pleasure craft operators. Transport Canada now requires any operator of any pleasure craft that has a motor to have a Pleasure Craft Operator Card (PCOC) or carry proof that they have successfully completed an accredited boating safety course. This regulation has been phased in for various age groups over the last 10 years. 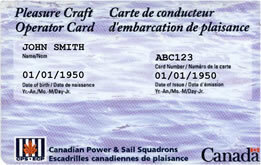 As of Sept. 15, 2009 everyone who operates a pleasure craft with a motor must comply. This includes helming Freya. In addition to enabling you to take the helm of Freya, the PCOC is recognized internationally and, perhaps most importantly, it provides good, basic information on safe boating and ‘rules of the road’, critical whether sailing busy English Bay or points beyond. You can find accredited trainers/testers through the Federal Government website, however Google will reveal many other local options. The club may arrange for a group testing date if there is enough interest. Please contact Training Officer Nadine Soukoreff for more information. The 2010 show has been postponed until February 9-13, 2011. See you then!